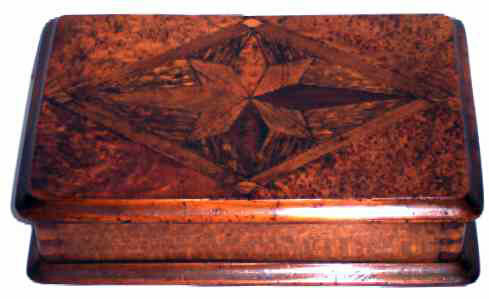 Presented here, a very fine inlaid and veneered Jewel Box. Cherry primary with mixed wood "Compass Rose" set into a Burled Ash veneered top. Virtually every section is a different kind of wood. It is truly a treat to the eye. Dovetailed construction and divided interior. The superb workmanship in this box is typified by the fine dovetailing. This was a work of love for some fine craftsman and the perfect gift for either a man or a woman. Pretty enough for a woman, yet strong enough to be a wonderful dresser box for a man. American, c. mid 1800's. Size is 9" long x 6" wide x 2-1/3" high.